Tonight I finally got up the courage to frogg the Noro cardigan. Now, don’t get me wrong – I really liked it. The problem was I was living in denial thinking that I’d magically make the arm holes half the size they were. The arm hole was big enough to fit BOTH arms with room to spare. None creative ways I could figure out how to decrease would make it look okay or not bunchy around the arm pits. It was time to just LET IT GO. Now I think I will make the Lady Elanore Entrelac Stole from Scarf Style with the yarn. I have more than enough to make it and I really love the colors of this yarn. Plus, I’ve been wanting a wrap to keep with me at work when I get cold rather than a sweater – most of my store bought ones are getting worn out and I don’t feel like buying more. 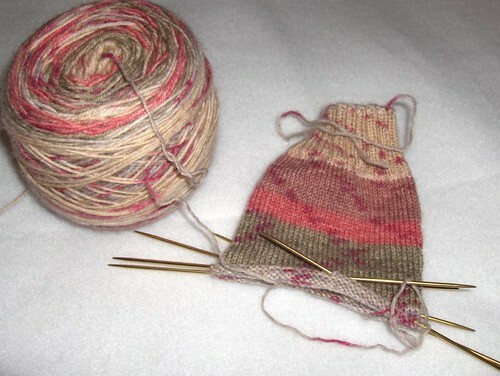 I am working on a plain sock. Nothing fancy, but it’s all I’ve been wanting to work on. I haven’t had the focus to work on anything more complex and just making the knit stitches here and there when I can makes me feel good. I take it everywhere with me and knit on it when I can. I actually really like it despite that it’s just a simple sock that I’m sort of making up as I go along. Sometimes simple is all you need. Sorry to hear about the cardi, but I completely agree with your assessment of the situation and would have been horribly upset to finish a sweater only to realize that the sleeves were monstrously too big. 🙂 I love the Lady myself and have been considering frogging Klaralund and perhaps making one!